نتایج پژوهش حاضر که در گام نخست، با استفاده از نظر خبرگان (به روش بازتابی) و در مرحله اول، از طریق پرسشنامه و در مرحله دوم، به وسیله ارائه نتایج و بازنگری در تعریف به دست آمد، نشان داد که اهداف کار و همت مضاعف، بر مفاهیم مدیریتی اثربخشی، بهره‌وری و کارایی منطبق است. پس از درک چیستی این اهداف، در گام دوم، الگوهای مختلف مدیریت سازمانی که قابلیت پوشش دادن به این سه مفهوم را در حوزه رسانه‌ها داشتند، بررسی شدند و با استفاده از تطبیق دو رویکرد منبع‌ بنیان و دانش‌ بنیان، به استخراج عناصری از آنها برای طراحی مدل مطلوب مدیریتی در رسانه پرداخته شد. در پایان، به طراحی و پیشنهاد چارچوبی برای طرح یک الگوی مدیریتی مناسب برای سازمان‌های رسانه‌ای اقدام شد که بر اساس آن، کارایی و اثربخشی در جریان فرایندهای تخصصی رسانه‌ای و مدیریت محیط داخلی، سبب ایجاد بهره‌وری می‌شود. تعامل سازمان با محیط خارجی نیز موجب سودآوری بهره‌وریِ حاصل می‌شود. 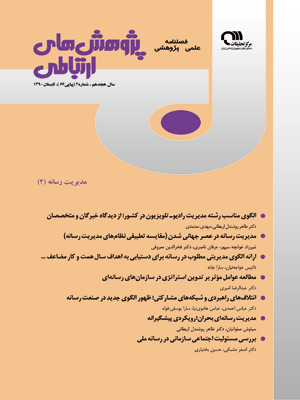 در نهایت تلفیق این دو، به عملکرد مورد انتظار می‌انجامد که اهداف کار و همت مضاعف از طریق آن برآورده می‌شود. The present study was conducted in two phases, using elites’ views through questionnaires, in the first stage, and results and reviewing the definition, in the second. The research shows that the objectives of “increased Attempt and Work” match the concepts of affectivity, effectiveness and efficiency in the field of management. Shedding lights on the objectives, the study addresses different paradigms of organizational management which have this potential to cover these three concepts in media. Employing two approaches, i.e. source-based and knowledge-based, the study works out some of the components of these paradigms to develop a desired media management pattern. It finally proposes a framework for developing a management pattern to be used in media organizations; a pattern in which efficiency and affectivity in the media specialized processes and internal management would bring about effectiveness. Interaction of an organization with outside will lead to its efficiency. Combining these two will bring about the expected performance through which the objectives of “increased attempt and work” will be realized. خواجه‌ئیان، داتیس؛ فرهنگی، علی‌اکبر و هادوی‌‌نیا، عباس. (1388). طراحی مدل تعاملی مدیریت رسانه با فناوری‌های نوین ارتباطی. فصلنامه پژوهش‌های ارتباطی، 60 (88)، صص 36ـ11. روشندل اربطانی، طاهر؛ خواجه‌ئیان، داتیس و اعظمی، امیر. (1389). طراحی سنجه‌های تأثیر بر مخاطب برای آگهی‌های بازرگانی در رسانه ملی. نشریه مدیریت بازرگانی، 2 (4)، صص 72ـ53. سید اصفهانی، میر مهدی و کاظمی، سید عباس. (1376). طراحی الگوهای اثربخشی سازمانی با تأکید بر معیارهای فرهنگ سازمانی. دانش مدیریت، 10 (37 و 38)، صص 157ـ136. فقیهی، ابوالحسن و موسوی کاشی، زهره. (1389). مدل سنجش بهره‌وری (اثربخشی و کارایی) در بخش خدمات دولتی ایران، نشریه مدیریت دولتی. 2 (4)، ‌صص 126ـ107. Alavi, M., & Leidner, D.E. (2001). Review: Knowledge Management and Knowledge Management Systems. MIS Quarterly, Vol. 25, No. 1, pp. 107-136. Aris, A. & Bughin, J. (2005). Managing Media Companies. Wiley Publications. Clegg, S.; Courpasson, D. & Philips, N. (2006). Power and Organizations. London: Sage. Cottle, S. (2003). Media Organisation And Production. first edition, London: Sage. Das, T.K. & Teng, B. (2000). A resource-based theory of strategic alliances. Journal of Management, Vol. 26, No. 1, pp. 31-61. Dubini, P. & Provera, B. (2008). Chart Success and Innovation in the Music Industry: Does Organizational Form Matter? Journal of Media Business Studies, Vol. 5, No. 1, pp. 41-65. Eilein Landers, D. & Chan-Olmsted, S. (2004). Assessing the Changing Network TV Market: A Resource-Based Analysis of Broadcast Television Networks. Journal of Media Business Studies, Vol. 1, No. 1, pp. 1-26. Lawson-Borders, G. (2006). Media Organizations and Convergence; Case Studies of Media Convergence Pioneers. New York: Lawrence Erlbaum Associates. Liu, F. & Chan-Olmsted, S. (2003). Partnerships between the old and the new: Examining the strategic alliances between broadcast television networks and Internet firms in the context of convergence. The International Journal on Media Management, Vol. 5, No. 1. McEvily, S.K. & Chakravarthy, B. (2002). The persistence of knowledge-based advantage: An empirical test for product performance and technological knowledge. Strategic Management Journal, No. 23, pp. 285-305. Miller, D. & Shamsie, J. (1996). The resource-based view of the firm in two environments: The Hollywood film studios from 1936 to 1965. Academy of Management Journal, Vol. 39, No. 3, pp. 519-543. Rao, P .M, & Miller, D.M. (2004). Expert systems applications for productivity analysis, Industrial management & Data system, Vol. 104, No. 9, P. 776 & 785. Slack, N.; Chambers, S. & Johnston, R. (2001). Operations Management. 3rd edition, Pearson Education Limited. SubbaNarasimha, P.N. (2001). Strategy in turbulent environments: The role of dynamic competence. Managerial and Decision Economics, No. 22, pp. 201-212. Tangen, S. (2005). Demystifying productivity and performance. International Journal of Productivity and Performance Management, Vol. 54, No. 1, pp. 34-46. Turow, J. (2009). Media Today, An Introduction To Mass Communication. 3th edition, London: Routledge.